Concepts: You awake in a hospital room. Stumbling from the bed, you look around, only to find that the hallways are empty. The desolation is broken by the sounds of others who, like yourself, have emerged from their comas. None of you remember your lives before this moment. Full disclosure, I love Betrayal at House on the Hill. All of my friends do, and we play it regularly. 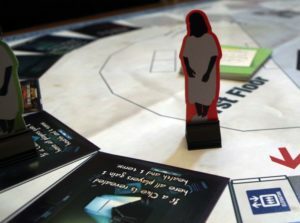 It’s one of our favourite games, and the idea of a game that clearly drew influence from Betrayal’s structure and formula but set within an abandoned hospital seemed fantastic. The game is divided into two segments – the first half, in which players explore the hospital and searching for items. When a player discovers a room, they lay a room tile onto the board to represent the room in question. They must then roll dice and aim to score a set number, lest they experience a hallucination. When a player searches a room, they can find items such as weapons (scalpels, brooms etc), medicine, or clues. Discover enough clues and the second part of the game – the Phenomenon, which contains the end-game setting and win conditions – is revealed. Mechanics: At the start of the game players are given Quirk cards, which task the player to score points if they take certain out-of-character actions such as coughing, giving instructions or touching other players – if you score enough points on this during the first part of the game, you gain a bonus during the second half. I found this to be pretty annoying and awkward, but other players liked it. Players are also given a Neurosis, which are special abilities which allow them to undertake special actions or rolls, and can be increased based on your Terror statistic. It is a little distasteful for what is, for many people, a debilitating psychological ailment like neurosis to be used as a super-power, however. Our players found that we forgot to use these as they seemed to rarely have a significant impact in the game. Your character will have several statistics – health is directly connected to Strength (used for combat) and Dexterity (used for moves and dodging). You also have Terror (used for Neurosis), which is inversely proportional to your Focus (used to resist Hallucinations). The game begins with your players standing in the hallway of the hospital. On each player’s turn, they can enter a new room, placing a room tile as they do so, or search a room. Entering a room allows the players to place a room tile – the players are then required to roll a number of dice equal to their focus statistic – if they roll a 5 or 6, it is a success. If you roll 1, 2 or 3 on your dice roll, it is always a failure – 4s are re-rolled, but when you re-roll a 4 you also add another dice to roll along with it. If they fail the roll, they are required to resolve a hallucination card. These cards work like Betrayal’s events cards, but with an extra twist. Writing: When I opened up the box, the first thing that I found was not just a rulebook, but an A4 sheet of errata. 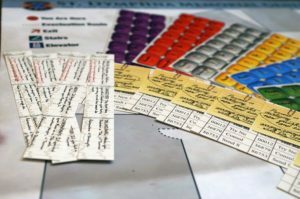 The rulebook – artistically designed to replicate a doctor’s file – contains an abundance of errors. Some details are missing, others contain typos and important rules are simply not well explained. I read over the errata sheet and it, too, contained some errors. This carries over to many of the cards, including in some instances those integral to the end-game Phenomenon. This isn’t to say that the game’s writing is poor throughout, though. The hallucination cards are atypically multiple choice, such as “You step into the room and find yourself in a large forest. Push forward, or turn and run” or “You see a ghostly shark floating in the air. Punch it or run away?”, the result depending on the choice selected. One point that we really did enjoy in the game is that many of the cards which appear to have the same scenario will have very different results – choosing to push forward through the forest once may give the player an item whilst another forest card might be entirely different. That’s great and I genuinely enjoyed that. However, there are some very serious concerns with the game’s tone that need to be addressed. The game aims towards a mature approach to horror, however above Hallucination examples are accurate to those listed on the cards. Some, such as the shark example, drew chuckles from around my gaming table. This is problematic, especially in a game that strives to handle themes including mental health. Three of the game’s Phenomenon include trigger warnings for themes including suicide, child abuse and sexual assault (which will already limit how many people are comfortable playing this game) and due to discomfort as to how the game might tonally handle those, I have respectfully opted not to explore those Phenomenon for this review. Design: a game that I deeply want to love and it has some genuinely wonderful ideas. For instance, the game includes room tiles as mentioned above, but it also includes fifteen hallucination room tiles. These are tiles that have beautiful artwork, and include images such as a room full of spectral hands, a room breaking apart and floating off into stars, and so on. These are vibrant and exciting, and I wanted so much to see them appear on the board. But they never did. As best I can understand, the only way for those tiles to become part of the game is if certain choices on a hallucination card are selected, or possibly during certain Phenomenon. That’s a huge shame. They should have been part of the main stack of room tiles, lying in wait for the players, but they weren’t. 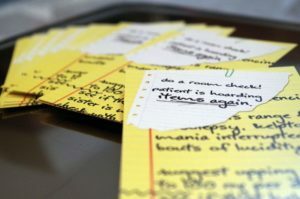 The cardstock for the room tiles is fairly poor and the strips of card used for the Neurosis are basically thick paper. that the game simply needed significantly more work before it was released. By the time we had played through the first half of the game, we had already had to home-rule several problems that had occurred – several antagonists had been spawned onto the board, appearing on the same room tile as the players, and the rules were terribly unclear on whether those enemies would deal damage at that point or on later turns. We would have more problems during the Phenomenon stage of the game, but all of these could have been resolved with clearer instructions, which could have been achieved through better proof-reading before the game went to print. Playability: And so, the second half of the game. Coma Ward’s version of the Haunt is the Phenomenon. At the start of play, four ‘clue’ cards are mixed into the top fifteen cards of the item deck. Each is maked A, B, C and D. Once you draw three of them, they correspond to the Phenomenon that becomes active and will determine how the second half of the game is played. A few words on this, though. Firstly, shuffling them into the top fifteen cards of the item deck seems to give a rather quick first half of the game, so I would recommend shuffling them into the top twenty or so. Secondly, several cards instruct the players to shuffle the item deck – don’t do this. In fact, the errata says not to do this, and it’s a flaw on those cards that really should have been caught during play-testing. And lastly, the code that we had for our Phenomenon was missing from our rulebook, so we just picked one at random. We selected ‘Quarantine’, and this is what happened. Setting up the Phenomenon was challenging, taking us almost half an hour to decrypt the intent behind the wording of the rules. Each player was given a card which was to be kept a secret, and it stated if they were Infected or Immune. There was a cure placed on the board which could turn a player Immune. Get all the players to be Immune, and you win. Each turn, players drew a new symptom from a new deck, the Symptom deck, and had to take any action listed at the start of their turn. It very quickly became clear that there was no actual tension building. Nothing was working against us achieving the cure, aside from the symptoms, which meant tension did not build significantly and that play generally continued as normal. I needed the cure, because I was infected – I had no idea which of the other players needed it. When one player picked up the cure and then just gave it to me, without using it, it was pretty cure that he had drawn the immune card, but there was no way for us to tell. Eventually I simply asked all players to raise their hands if they were immune – the remaining two players all raised there hands. Of course, this broke the rules as written, but the game wasn’t going to end otherwise. Once I had the cure, I waited for my turn to use it, only for the symptom card to immediately end my turn without giving me a chance to apply the cure. This happened to me for three turns in a row. Meanwhile one of our other player’s symptoms became so vicious that he died before he could take any actions, essentially locked down by drawing harmful symptom card after harmful symptom card. So after a fourth turn in a row of being unable to use the cure due to excess vomiting as a symptom, one of the immune players simply caved my character’s head in with a broom, allowing the game to end. 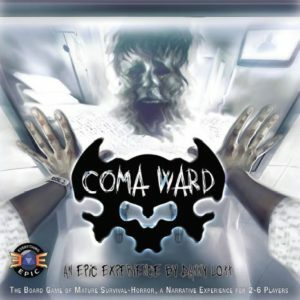 Conclusion: Coma Ward was a game that I had so much hope for. It is full of potential and burgeoning with promise – and there are moments of genuine sheer excellence to find here. Each of us came away from the game with thoughts of parts that worked really nicely. It’s a game that I genuinely want to love. But at the end of the day, it’s under-written. The errata in the box attempts to tackle this by reminding players that rules are there as a guide to provide an experience, and that players are encouraged to create and change the rules to suit themselves. And while that is true, in this case it simply doesn’t make up for that the rules that come with this game simply do not work, and that is a flaw that rests squarely on the designers. I genuinely and sincerely hope that we will get to see a second printing of Coma Ward – one that resolves so many of these concerns. Although I am certain that the developers are genuinely excellent people who do seem to be dedicated to continuing support of this game, and as of the time of this review going live are working on FAQs and rectifying concerns for the game. And that’s fantastic. But many of these issues are ones that should be caught before a game ever goes to print. FINAL THOUGHTS: A game full of beautiful ideas, exciting themes and genuine potential, but massively hampered by being brought out of the oven long before it was finished baking.